posted by tera bonner in ..
posted by Lisa Ace in Sponsored Post, advertisement, Reliant Real Estate, real estate, Pavilion, Lynn Bezon, ..
Super solid move in ready raised ranch home on quiet half-acre country lot! Move in and enjoy no honey-do lists on this 3 bedroom 2 full bath home. Downstairs features a large family room with gas fireplace, pretty ceramic floors, brand new full bath-perfect hang out room or an awesome large master bedroom suite! Upstairs features hardwood floors large open kitchen/dining/living space ideal for entertaining! Three bedrooms with full closets and another brand new bath. Not a lot to do here but decorate! Outside is nicely landscaped and lot backs up to fields with pretty views – very easy to see. 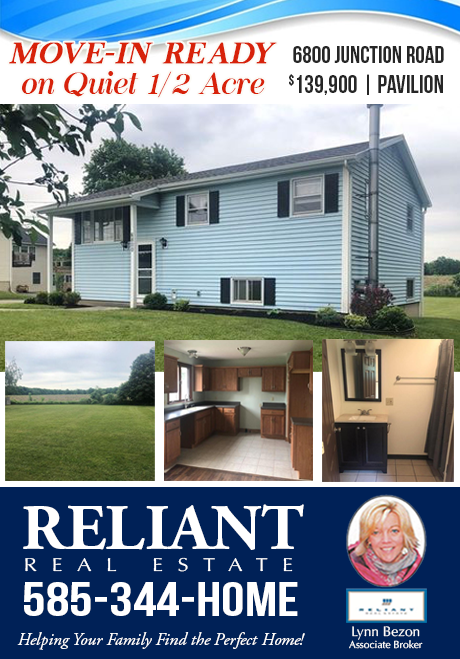 Call Lynn Bezon, Reliant Real Estate 585-344-HOME or click here for more information on this listing. posted by Elizabeth Downie in ..